The region of the Nahe Valley-Hunsrück, the historic Nahegau, is divided into three administrative districts: to the east lies the district of Bad Kreuznach with its administrative seat in the city of Bad Kreuznach, to the north is the district of Rhein-Hunsrück with its administrative seat in Simmern, and to the west is the district of Birkenfeld with its administrative seat in the city of Birkenfeld. To the north there are also the districts of Cochem-Zell and Bernkastel-Wittlich bordering the Mosel river. Although the form these districts have today only dates from the administrative reform of the Rhineland-Pfalz region in 1969/1970, their origins can be found 200 years earlier, first under the French ruler Napoleon and then, after the reconstruction of Europe by the Viennese congress, under the Kingdom of Prussia. In 1798, under French rule (1798-1814), the feudal system with its class privilege, serfdom and drudgery was eliminated, and, to ensure the division of authority, administrative and judicial powers were separated. All religious faiths received equal rights, and in 1804 these rights were implemented by a unified code of law, the Napoleonic civil code [Code civile Napoléon]. As a result of an act of the Viennese Congress, the final act of 9 June 1815, the Prussians were awarded the area north of the Nahe. On 14 May 1816, the "royal government" in Koblenz officially announced the newly formed "districts" as administrative units, so this date is considered the official "birthday" of these districts. 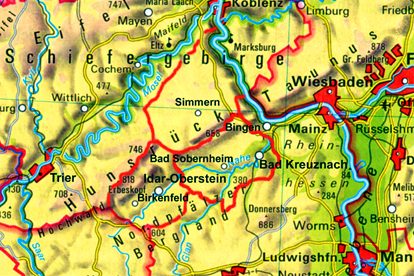 It should be mentioned that the historical "Nahegau" only encompassed the eastern part of the District of Birkenfeld. The border ran along the Heimbach, a few kilometres west of Baumholder, along the Nahe up to Siesbach, just before Idar-Oberstein, along the Siesbach almost to the Erbeskopf, and from there over the ridge of the Idar forest to the Idarkopf. A look at the map here also shows that the mouth of the Nahe near Bingen (belonging to the district of Mainz-Bingen) and the north-western part of Hunsrück (belonging to the districts of Cochem-Zell and Bernkastel-Wittlich) complete the region.